Find out everything you need to know on the new Hyundai Santa Fe from independent vehicle review website Car And Driving. You can watch the video review to the left to see more of the car or read their written review below to get a true insight from an expert in the automotive industry. 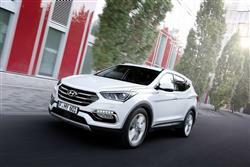 Hyundai has taken another step forward in the family-focused SUV sector with this revised third generation Santa Fe. The 4WD 7-seat version's the one to have. Jonathan Crouch reports. With crisper styling, impressive equipment levels, a chassis tuned for British roads and a punchy 200PS 2.2-litre diesel engine under the bonnet, the latest Hyundai Santa Fe punches its way upmarket on merit. Customers choose between five and seven seats, manual or auto transmissions and get four-wheel drive. Most UK buyers want the 7-seat 4WD variant we look at here and it's certainly a strong package. You know, the cleverer car manufacturers out there might just have found market niches that at first seem completely unintuitive. McLaren make supercars for people who are embarrassed by supercars. Ford makes its S-MAX MPV for people who wouldn't be seen dead in an MPV. And this car, the Hyundai Santa Fe, is an SUV for people who wouldn't normally entertain the prospect of one. To date, most SUVs have been a bit showy; rather unnecessary vehicles that hint at pretences of rural affluence or urban bling. The Santa Fe has always been cut from rather different cloth. This third generation model, introduced in 2012 but recently updated, might be a sharper looking thing than both its forebears but it remains a vehicle that's about good ideas and common sense first and foremost. You'll buy one of these if you value its utility. That and the fact that there's nothing about it that's annoying. That might sound like damning with faint praise, but if you're going to spend three years in its company, it's a value you'll greatly appreciate. Its rivals have looked and learned from the Santa Fe's quiet rise to success and have upped their game accordingly. Does the latest car have enough ticks on the plus side of its ledger to make a convincing case for itself? Let's find out. How an SUV drives is usually pretty far down the priority list after how it looks, what it costs and how much room there is inside. We used to take it as read that an SUV would be about as sharp as serving of refried beans to drive but in recent years we've seen the pendulum swing back the other way with 'sporty' 4x4s with decidedly brittle ride quality. The Hyundai Santa Fe is different. While it's a long way from the lax body control of old-school SUVs, it's not in any way a sharp steer. Don't take that as a criticism. The UK makes up around a third of all Santa Fe sales in Europe and therefore Hyundai has spent some time and money tuning the suspension of the car to suit our frankly horrible roads. Like many vehicles of its type, it's front wheel drive most of the time, but when sensors detect slippage, up to 50 per cent of drive can be diverted to the rear wheels. So far, so predictable. Unlike many 'part time' four-wheel drives, the Santa Fe can be locked into 4x4 mode at the touch of a button which is perfect for especially slippery conditions, such as muddy off-roading or driving on snow or ice. What's more you can do this on the fly at speeds up to 40kmh. Engines? Let's try singular. We only get a 2.2-litre all-aluminium diesel powerplant but it's a solid unit. You've still got 200PS of power arriving at 3800rpm so it's reasonably quick. The sprint to 62mph is dispatched in 9.8 seconds in an all-wheel drive model though you'll go a little slower if you specify the six-speed auto gearbox. There's self-levelling suspension as standard on seven-seaters and a FLEX STEER system delivers normal, sport and comfort steering modes. The latest Santa Fe isn't quite the sort of car that will have pedestrians bumbling slack-jawed into pavement furniture but it's undoubtedly a good looking thing. It has that inherent rightness to its proportioning that'll make it tricky not to throw a glance over your shoulder when you lock it and walk away. Road presence is enhanced by smarter front and rear bumpers with redesigned foglamps and LED daytime running lights, framed with smart silver trim. At the front, a different layout for the xenon projector headlamps has been applied, while the rear lamps feature a fresh LED graphic. We love designer-speak and Hyundai reckons the Santa Fe's lines are influenced by its 'Fluidic Sculpture' form language, with its own design concept called 'Storm Edge' which captures the strong and dynamic images created by nature during the formation of a storm. We'll have what they're having. Inside, Santa Fe remains a refined and comfortable place to be with updates to the console cluster and audio visual navigation system presenting the car's intended up-market image. As before, there's a choice of five or seven-seat interior configurations, while a long, wide, single-frame panoramic sunroof allows high levels of natural light into the cabin. Luggage space is decent - 534 litres with the front five seats upright. Passengers sitting in this improved model's second row of sliding seats will benefit from greater space as an extra 15mm has been added to the travel, boosting the adjustment to 270mm. Get used to the fact that you're going to be paying in the £30,000 to £35,000 bracket for this car, once yopu specify it the way you'll want to. Still, that's not too bad for a large, 7-seat 4WD SUV that can do just about anything your family will want. Still, you do get a lot of gear for your money. Even the entry-level trim will net you cruise control, rear parking sensors, three-stage heated front seats, Bluetooth with voice recognition, steering wheel mounted stereo and phone controls, AUX-in and USB connections for the stereo and a trip computer. There's 18-inch alloy wheels, front and rear skid plates, a rear spoiler with an integrated brake light and body-coloured doors and mirrors. Go for a range-topper and you'll get gear like 12-way electrically adjustable driver's seat trimmed in leather, keyless entry, touch screen satellite navigation, a ten speaker premium sound system with separate subwoofer and amplifier and a smart parking assist function. As well as offering decent value for money, the Santa Fe isn't going to break the bank when it comes to day to day running costs. With no petrol engine in the range, it's hard to come up with a model that is anything other than saintly in terms of economy and emissions. There is one slight caveat though and that's the automatic gearbox. Compare manual and auto versions of this Euro6 design and the manual can register as much as 46.3mpg on the combined cycle and as little as 161g/km of CO2, whereas the automatic fares markedly worse at 42.2mpg and 177g/km. Still, it's worth putting even that worst case figure in perspective. Getting better than 40mpg from a seven seat four-wheel drive vehicle really isn't that bad is it? Residual values look extremely good in part thanks to the Santa Fe's increasingly strong reputation for reliability. Owners also take advantage of Hyundai's excellent Five Year Triple Care deal. This includes a five year unlimited mileage warranty, five year RAC roadside assistance and five year annual vehicle health checks from your dealer. If you're a higher mileage driver, this could well swing the balance in the Hyundai's favour. Even if you're not, what value do you place on five year's peace of mind? Think about that when you're comparison shopping. The Hyundai Santa Fe has improved and improved fast. In fact it's a great choice if you've never really considered an SUV before. It's not showy or offensive. In fact it marries all the best bits of SUVs - namely their space, versatility and ease of ownership - with the refreshing lack of drama of a normal big family car. If you've got a family, have room in your life for one car and need one that'll discreetly go the distance without a hiccup, you need to try this Korean contender. Then try its rivals. I'm guessing you'll be back at the Hyundai dealer before too long. It's that good.